Official The TCF 2nd Anniversary Shindig! Discussion in 'Community News & Features' started by Matsu, Sep 26, 2016. Good morning/afternoon/evening/night Terrarians of all shapes and sizes! As you may or may not know today, September 26, 2016 is the second anniversary of our humble little forum. As with last year we would like to take this chance to extend a hand to you, the community, with another "contest." You may have noticed that the word "contest" was in quotes, time to explain that. Unlike last year when we had a clear cut theme of, "1.3 and 1.3 related things" this year we have a massively different theme; spirit. 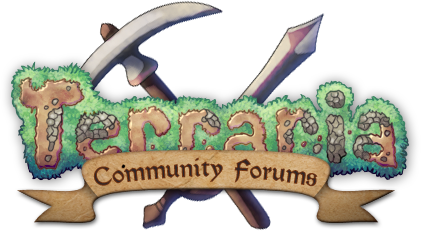 While we sat around discussing what to do we came to the conclusion that this is not an anniversary of Terraria, but of the Terraria Community Forums. As such we are extending you the chance, to quote one Tsuki, "[to] go nuts with any sort of user-generated content." Unlike last year there will be no hard set categories to submit into, so go wild with your ideas and submit anything you want. Come one, come all - PC, Console, and Mobile players are all invited to showcase your love of the game and this community with the most creatively charged project you can come up with. And when we say you can submit anything, we mean anything; not just art or in-game builds (though those are perfectly fine!) but anything else your mind can conjure up. Maybe some pottery or baked goods or a live action play - let your imagination run wild! No stealing another person's work. If you are found guilty of this your entry will be removed and you may get additional punishments in accordance with forum rules against plagiarism. You may edit your post to switch your current submission with another as much as you want, but the contest section will be locked on October 26, 2016 at 11:59 PM PST. While not a set in stone rule, putting your image in a spoiler is much appreciated for people with low end computers. Needless to say, global forum rules still apply, and excessive profanity or inappropriate content will not be suitable. You may only submit one entry to this contest, but it can be edited to your heart's content right up until the deadline. Make sure your submission is related to Terraria and/or the Terraria community. Entering is simple! You make a post in this Submission thread before the deadline. After the ending date all entry's will be final. You must make your entry in the submission thread or it will not be counted; submissions made in this thread will not count, and may be deleted or moved as necessary. The contest's entry phase will be from now, to October 26th. Entries will not be accepted after 11:59 PM PST on October 26th. This is to allow the highest amount of leeway for people entering on the final day. We will judge your entries based on Creativity, Originality, and Overall Spirit. Showing a unique idea with a lot of heart is what we're looking for. The judges panel will be comprised by members of the TCF Moderating team, with the final decision on winners being made by the Re-Logic Staff. Similar to last year everybody that participates in the contest this year will receive a special title that can only be obtained in this way. Additionally five "winners" (for lack of a better word) will be chosen and awarded with a second unique title that can only be obtained in this way. We are looking forward to seeing what all kinds of amazing things you are all going to make! If you have any questions about the contest, rules, or how to enter, feel free to ask here, or PM a moderator! Remember to post your submissions here in the Contest Entry thread if you want them counted! Ilmarinen, OddGirl, DankySkeleton and 58 others like this. Awesome! Competitions are great fun! Noelle, DankySkeleton, Sword Ace and 6 others like this. Looking forward to seeing everyone let their imagination run wild and posting cool things full of untamed passion and spirit put into them! DankySkeleton, XSlayer300, Deeked and 4 others like this. Soooo excited to see what the community creates this year! DankySkeleton, stefnotch, Jon Smitten and 6 others like this. Well, time to get back to writing, or maybe something different this time? Who knows? I sure don't. Also, I really want to see what other people come up with, this is always so awesome! Noelle and Jerion 'Wyverntamer' Kràl like this. Can't wait to see everything you guys make! UberCAKE, iTerra9791, DankySkeleton and 8 others like this. Now THIS looks interesting. I'm definitely going to enter something! Look forward to seeing all submissions! Jerion 'Wyverntamer' Kràl likes this. Can't wait to see what people make! TerraDream274, DankySkeleton, L0ST5ILVER and 1 other person like this. I am really excited to see all the fantastic out of the box creations that are submitted celebrating this game and community. The sky's the limit, and if it involves French fries that's even better. DankySkeleton, PlanteraBlade and Jerion 'Wyverntamer' Kràl like this. CONTEST!!!! NEAT! I'm in, definitely! Yaaaaaaaaay. A prize which isn't tangible in any way shape or form. I love how everyone seems welcome to creations of all kinds, but the moderators are only in it for the food. But still, though, this is my first TCF anniversary party, so I'd like to see what these have to offer! What else would I be in for, if not the massive piles of pasta? DankySkeleton, Sonnette, Jon Smitten and 6 others like this. Can you have multiple submissions? 1. Can we submit multiple things? Each person is allowed one and only one submission for this event. You may edit your submission as many times as you want until the end of the contest, but you may only have one submission. Could a sprite end up being put into the game? That would be the best thing ever!